Are you growing Tomatoes this year? Do some or all of your tomatoes look great until they ripen and then look like the above picture? I have a few tomato plants that are producing tomatoes like the picture. They look great except for the top where the blossom used to be attached. 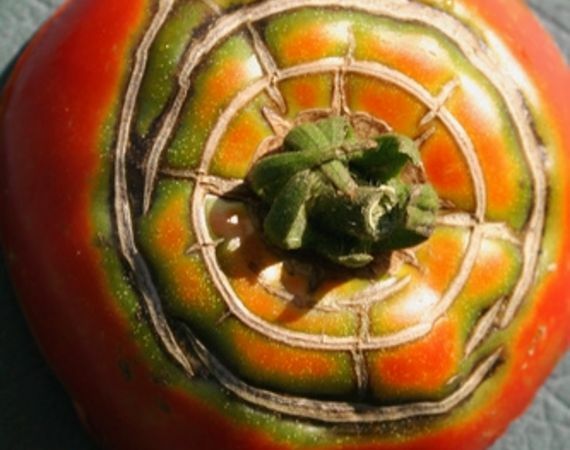 There might be a dark circular indentation around the top of the tomato or you might find a very dark rotten spot, with the rest of the tomato looking as healthy as can be. If you are finding this in your tomato garden, chances are that it’s Blossom End Rot, which is most likely caused by a calcium deficiency. I just learned that to fix this problem all you need is a bag of Epsom salts (Magnesium Sulfate) and a water hose. Apply 1 teaspoon of Epsom Salts per foot of plant. Apply the Epsom Salts in a circular fashion around the drip line of the plant and water well. Be sure your tomatoes are getting at least 1 inch of water per week, but don’t soak them. Tomatoes don’t like wet “feet” but rather prefer to take in their drink of water and then be dry. I just applied the Epsom Salts to my plants and will be checking frequently to see if this eradicates the problem. I will post an update on my results in a couple of weeks. You are currently reading Tomatoes and Blossom End Rot at Michelle Conaway.